We see you and want to thank you for your continued support and active participation this year. This year has been full of exciting programs and exhibitions that we hope you have enjoyed. As we prepare ourselves for the new year we want to make sure we can count on your participation and support for another year. We are asking our members to give a little more! We want to hear from you, let us know how we can better serve you and continue growing our strong community base. We have 270 members to date. If each member gave a donation of $50 we would be able to reach our goal this year. There are only 2 months left to reach our goal! 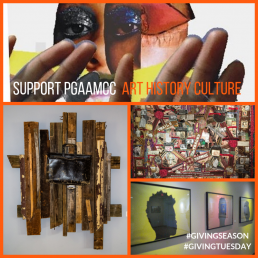 I hope you will make a gift to PGAAMCC today to help us educate our community about the rich history and culture in Prince George’s County. Our Cultural Education Passport Program that helps provide a fuller, more complex narrative and images about the African American experience and community for children and youth. Art & History Exhibitions tell the stories of the diverse experiences of the County’s African American communities and aim to reflect the broad spectrum of social and cultural activities. Special Programs bring together diverse groups of people to create new approaches to cultural understanding. General Operations support our staff and administrative success. You can make the difference for so many influential teachers, artists, and thousands of students. Please make your gift today! Stop by to get your official PGAAMCC merchandise today! Call 301-809-0440 for more information.